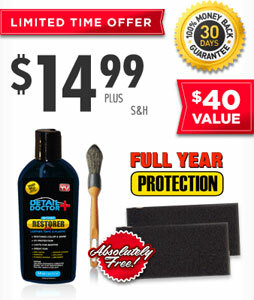 Detail Doctor is a liquid vinyl, leather and plastic restorer that brings back the color and shine of your vehicle. You can use it on everything from your headlights to your dashboard, leather, bumpers, mirrors, and practically every part of your vehicle (both interior and exterior). Anywhere that you see needs a bit more shine to it, just wipe it with Detail Doctor and it should bring back that new car look. To use, simply take the detail applicators and brush and spread a thin coating of Detail Doctor on your vehicle and wipe it down in a circular motion. Allow to dry for a few hours before applying a second coat if needed. The product is designed for non-professionals and you won’t have to visit a detail shop or wait for days for your car to be serviced and returned to you.